"My gut is that it's entropy," says Dalton. "It makes me think that people are lazy. Like they're just reblogging the same stuff." The artist, who has previously charted the ways in which female cultural figures have been visually portrayed in the New Yorker (hint: cheesecake), has used this research to create new works for her latest solo show at the Winkleman Gallery. 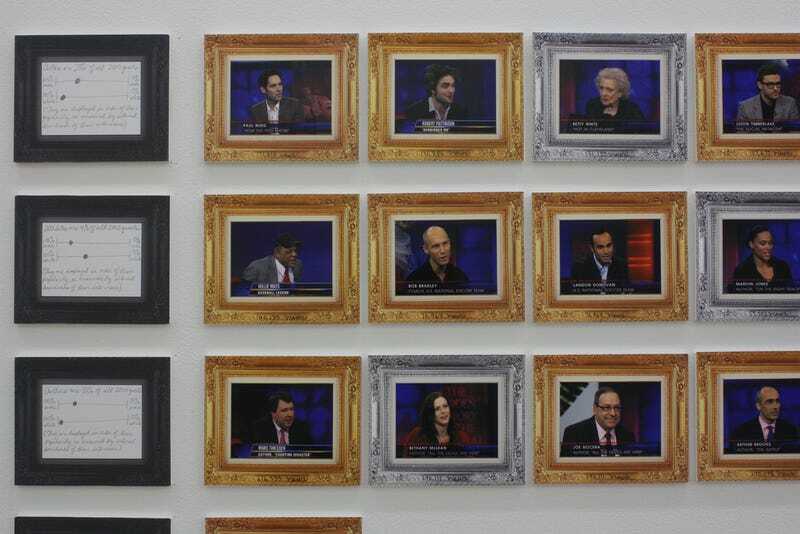 The central piece (shown at right) is devoted to the Daily Show, the program that spurred Dalton's recent quest. In it, she has organized the guests by subject areas (authors, athletes, etc.) and placed the men in gold frames and the women in silver ones. The colors say it all. Dalton says the piece was born of equal parts rage and glee. "These are heroes of mine and I think they're doing really important work," she explains of figures such as Stewart and Colbert. "But I just end up confused. It's like are you with me or against me? I think of you as on my team, but maybe you don't think of me as on your team?" She hopes that her work might get someone in some aspect of the media business to think a little bit more critically about what they do: "I would just love for these producers to be like, ‘Here's a pile of women we rejected. Did we reject them too quickly?'" In order to do that, some of these programs might have to start by hiring a few more. Jennifer Dalton: Cool Guys Like You is at the Winkleman Gallery, in Chelsea. Carolina Miranda is a freelance writer based in New York City. She blogs at C-Monster. Follow her on Twitter at Cmonstah. This post originally appeared on C-Monster. Republished with permission.